Pushkar Mela, conducted in a town called Pushkar in Rajasthan over a period of five days, is the largest camel and livestock fair in the country. With around 50,000 camels being gathered in one place, this is the largest camel fair in the world. These animals are brought together to be bought and sold as well as exhibited. Although livestock trading is one of the primary purposes of this fare, religious pilgrimage is the other. Moreover, since the tourist value of this fair is really high, Rajasthani, as well as Gujarati traders (who come into town explicitly for this festival), bring with them a variety of items such as paintings, clothes, jewelry, shoes etc. to be sold at the fair. According to Hindu mythology, the deities once released a swan with a flower in its beak. The place where the flower dropped from the swan’s beak was deemed sacred because Lord Brahma performed a huge yagna there. This place came to be known as Pushkar, which literally translated means ‘to be born due to a flower’. This site has since then, become a sacred place of worship for practicing Hindus. 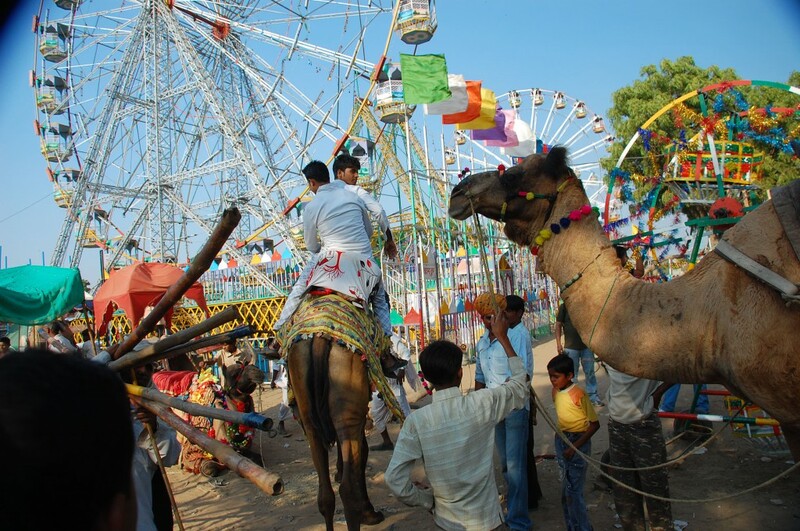 Although the fair at Pushkar begins as a trade for livestock, it culminates on a holy note wherein devotees take a dip in the lake of Pushkar and visit the numerous temples that are spread across the town. While the jacket that Rajasthani women wear covers their entire torso and extends to the hips, Gujarati women wear a bare-backed blouse that goes below the waist. Some Gujarati women also wear sarees with local prints or embroidery on them. The style and colors of the turbans worn by the men from these two states is also different. While there are any number of embroideries that are done in both of these states, some of which are common too, Gujarati men and women mostly wear garments rich in Zardozi, Kutch and mirror work whereas Rajasthani folk wear clothes embellished with zari, gota work, danka as well as tie and dye. The arm bangles that are worn in both cultures are different in appearance. While Gujarati women wear colorful glass ones, Rajasthani women wear white ivory ones. However, both cultures showcase a lot of silver jewelry in their attires. A number of ethnic trinkets and souvenirs are available for purchase in Pushkar, especially at the time of the fair. 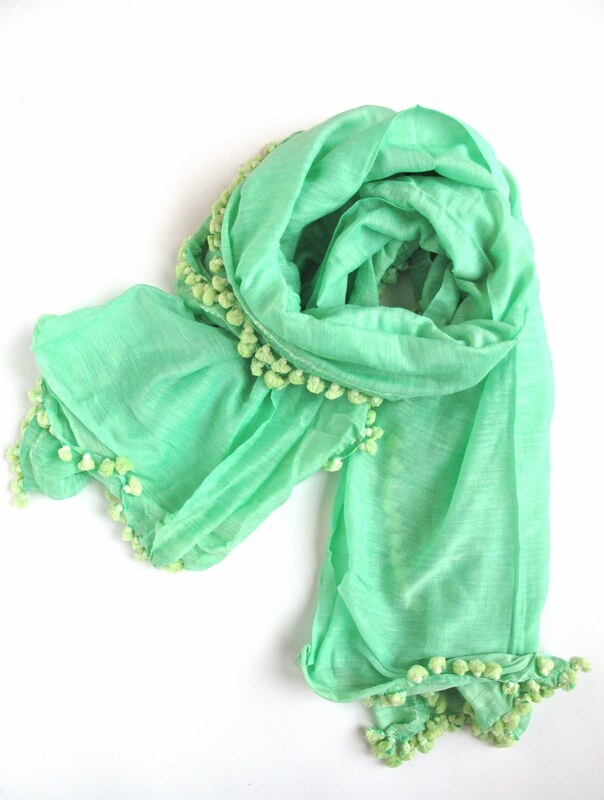 For instance, silver wrist and arm bangles as well as earrings, beads for the wrists as well as the neck, embroidered shoes and leather shoes for both men and women, textile fabrics in cotton, silk and chiffon, dupattas or odhnis with tie and dye or block prints on them, glass bangles, cloth bags and many more fashion items are up for sale at this fair. Ethnic jewelry which is a specialty of Rajasthan, especially in lac, or clothing items in indigenous embroidery are also easily available. While the above mentioned items can be worn by the buyer, there are certain items that are more suited as keepsakes such as the colorful turbans, costume jewelry, shoulder bags and more. 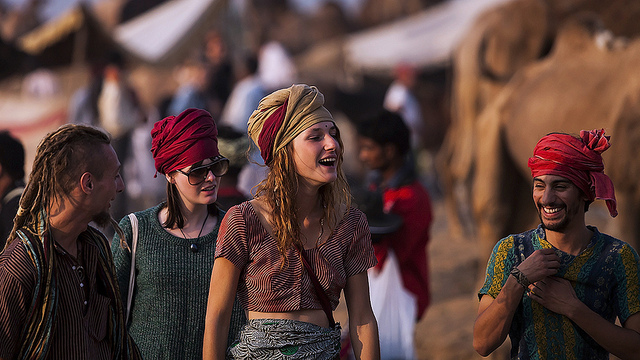 Pushkar Mela is said to attract thousands of people from around the world. In fact, many tourists who visit this fair wish to emulate the attires worn by the locals because of their sheer uniqueness and appeal. 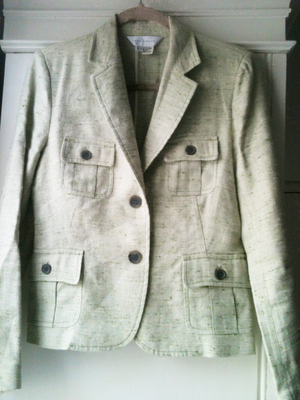 The clothes are not just brilliantly hued but are also comfortable to wear. The turbans and odhnis are elements of the attire that attract both men and women, especially those who are of a different nationality. Both sexes sport turbans as well as odhnis that they drape around their necks. This phenomenon has come to show that although in the local culture certain items are considered gender specific, in the global fashion scenario they have been adapted to become vital accessories that can be adorned by both sexes, as and when the costume demands. If not, these items can be worn just for fun and sport. Any number of innovations have sprung up from the traditional dresses that one sees at the Pushkar fair. 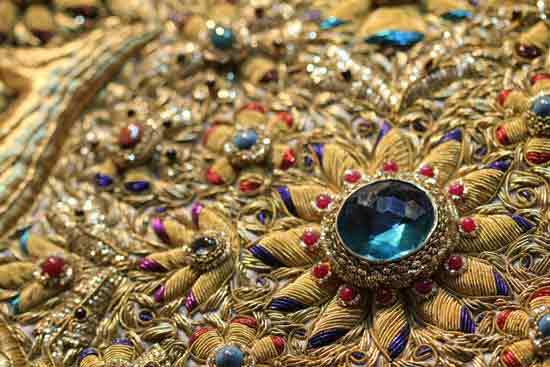 The lehenga choli or ghaghra choli has now been modernized to become the ideal party wear the can be embellished with any number of embroideries; not just the ones that emerge from Rajasthan or even Gujarat. 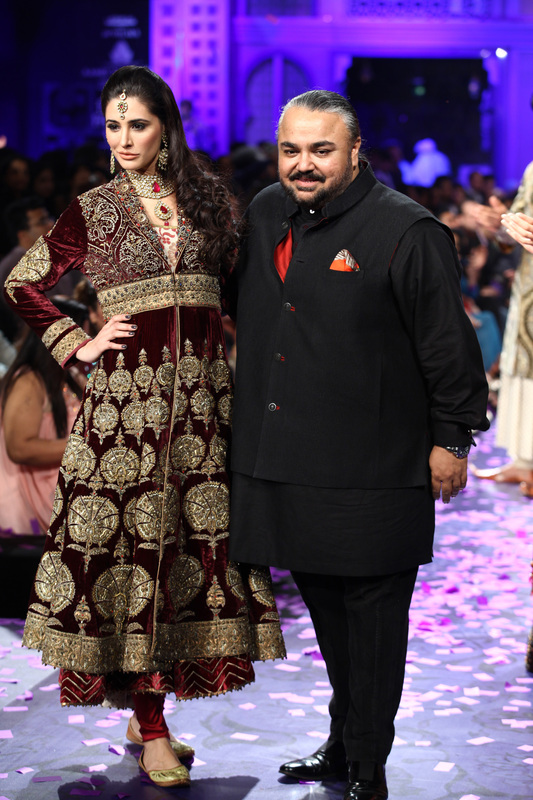 The lehenga and the saree have also been merged to form a new garment known as the lehenga saree. The dhoti has transformed into dhoti pants for both men and women; which is not just stylish but also easy to wear, as opposed to the traditional dhoti. The jootis or mojaris that originated in Rajasthan and Gujarat are now worn by Indians across the globe, by both men and women, and even others who visit India and prefer shopping for ethnic Indian items. The odhni’s evolution in India begins from being a covering for the face, head and neck to being a fashion accessory that can be draped around the waist and over the hands. Although these odhnis are as gorgeous and have intricate embroidery on them like the conventional ones, the style of draping them has transformed to meet the modern woman’s definitions of fashion and style. The Pushkar Mela starts off with a camel race. On the last day of the festival in a ceremony called the Deepdan, the visitors set off several lit clay lams on leaf boats at dusk. 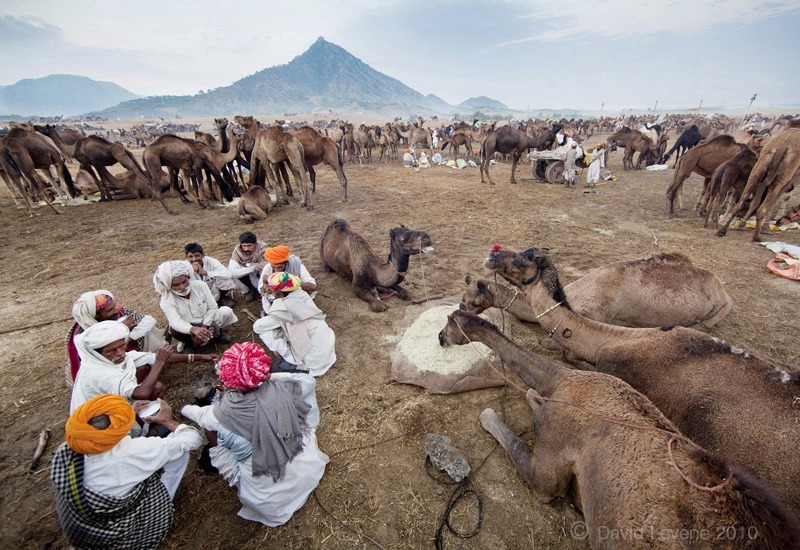 Herders with their camels and livestock start flooding into Pushkar and setting up residences at least a week before the actual commencement of the fair. The camels, in order to attract buyers, are bedecked and tattooed with paints as well as shaved in peculiar yet pretty designs. There are about 400 temples in the town of Pushkar.